Heat resistant material up to 270oC/518oF +/- 5%. The Grill Light uses 3 AA batteries. Use screwdriver to remove the screw on bottom, Remove the cover and insert the batteries and align the battery with + and - mark. Remove batteries when storing product for extended periods of time. Avoid contact with water as moisture can damage Grill Light. Touch the button 2s to turn on the light. Adjust the brightness of the light by pressing the switch button on the top of the light. Remove batteries when not in use for 2 months or more. Click "Add To Cart" NOW!! And Grab your BBQ Grill Light. NEW AND IMPROVED DESIGN: The Ziebs Shags Barbeque Grill Light is powered by 10 ultra-bright LED lights which produce more than 100 lumen which brightens the whole grill. ENERGY EFFICIENCY: Our BBQ grill light comes with unique touch sensitive power button with three dimming levels: 10%, 75% and 100% that are designed especially for battery life saving. RELIABLE: The Ziebs Shags grill light is water and heat resistant - stands extremely hot grills up to 270oC/518oF +/- 5%. 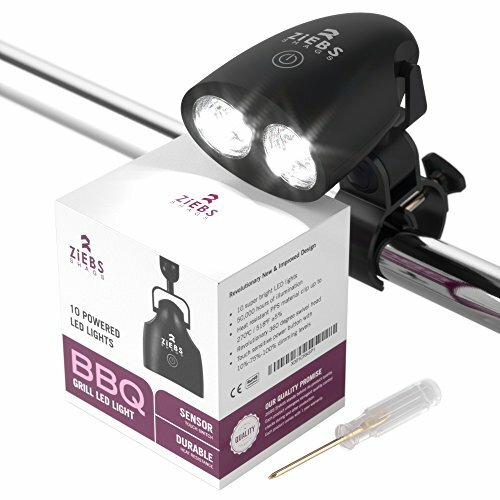 EASY TO SET-UP: Set-up your Ziebs Shags grill light in few seconds without using any tools. Just position the light on any grill handle and tighten the thumbscrew finger tight. 60 DAY MONEY GUARANTEE: If you face any problems with the Ziebs Shags bbq grill light, we will replace your light or refund. We are only a mail away! If you have any questions about this product by Ziebs Shags, contact us by completing and submitting the form below. If you are looking for a specif part number, please include it with your message.